Yuri Tremler, "Music at the Bar'" Limited Edition Serigraph by Yuri Tremler, Hand Signed with Certificate. 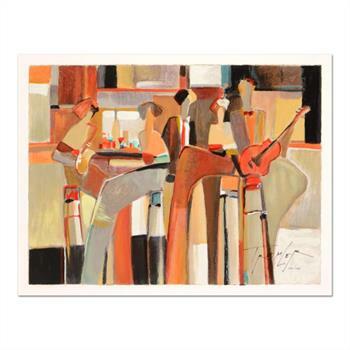 "Music at the Bar" is a limited edition serigraph on paper, hand signed by Yuri Tremler. Includes Certificate of Authenticity. Measures approx. 20.5" x 14.5" (border), 19" x 13" (image). Born in the Ukraine in 1961, Yuri Tremler attended the College of the Arts in Kharkov, (the second largest city in the Ukraine), and the Kharkov Art & Design Academy. He later attended Gall Design School in Germany before returning to his hometown where he worked as a metal smith and a theater decorator. Immigrating to Israel in 1996, Tremler worked in crafts, industrial design, interior design, jewelry design, and participated in many exhibitions. He came to explore the world of painting a bit later in life, dedicating himself almost exclusively to that endeavor sometime around 1998. Yuri Tremler's striking and spontaneous palette clearly expresses a gamut of emotional states and moods. His paintings please the eye with a richness of color, a great sense of balance and confident brushwork. 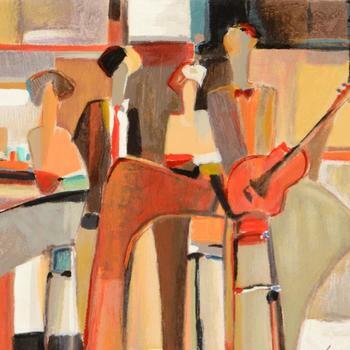 In Tremler's creations, one can find echoes of the avant-garde movements from the early 20th century, themes of bohemian lifestyles, or memories of conversation over a cocktail from long ago. Subjects of Tremler's paintings seem to be distant and blurred, but they capture poetic moments of life. His art reminds us of a sudden moment captured in a freeze-frame, an instant experienced after an intimate party, time spent with friends, or a shared past which still brings excitement and delight to mind. Sometimes whimsical, sometimes nostalgic, Tremler's art reaches inward to the basic emotions of humanity. His creations are exhibited in art shows and galleries throughout Europe and the United States.